The church was originally built as a chapel of ease to the Parish Church of St Mary, Horton. The Revd. William Greenwell, Perpetual Curate of Horton in 1856 was interested and concerned for the education of children. His approach to the trustees of Thoroton and Croft resulted in a grant of land in the new suburb of Waterloo for the building of a Schoolroom, a Parsonage and a Chapel which was consecrated in 1864. 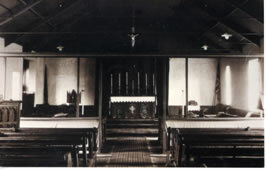 In 1896 the chapel became the Parish Church and extensions began in 1897. A site was offered for a proposed Mission Room which was dedicated as St John’s Mission in 1901 to serve the residents of Cowpen Quay. It was used until 1957 when worshippers joined the congregation of St Mary’s. The Church is situated at the West end of the central Market Place which is overlooked by a Crucifix within the cartilage rescued from a London church destroyed in the Second World War. 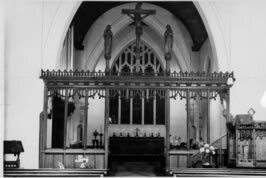 In 1912 a chancel screen was erected made by R. Hedley, a well known and respected wood-carver. All that remains is the Rood crucifix suspended from the chancel arch and the sacristy door made from some of the wood. Two carved supporting figures are stored The Lady Chapel altar was a gift from the Girls’ friendly Society and was dedicated in 1926. the figure of Our Lady and the Holy child came from St John’s Mission. The War Memorial situated on the north wall of the Baptistry was dedicated in 1918. By 1919 the names of over 200 men of the congregation who served in the Great War were inscribed, 59 of them lost their lives. 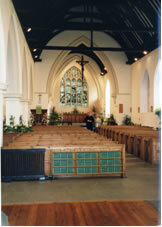 It is the work of R. Appleby who was trained by the wood-carver who made the Chancel Screen. The High Altar together with the magnificent East Window provide an imposing focus for our worship. The subject of the window is taken mainly from the Book of Revelation and was dedicated to the Glory of god in 1913. The South wall of the Nave has the Greenwell window erected during the time of Revd. Greenwell in memory of his wife. The window in the North wall of the Lady chapel, dedicated in 1950 was designed by L.C. Evett A.R.C.A. depicts the Risen Christ and Mary Magdalene in the Garden. The roundels illustrate the indigenous plants of Northumberland. The Campbell memorial Window was installed in 2001. designed, made and fitted by John K. Clark, a prominent glass painter, it depicts the dominical Sacraments (baptism and the Eucharist and the Glory of Heaven). It is a symbolic representation based on the theme, “Christ yesterday, today and forever”.